I cannot say this enough … I have no idea about nutrition. 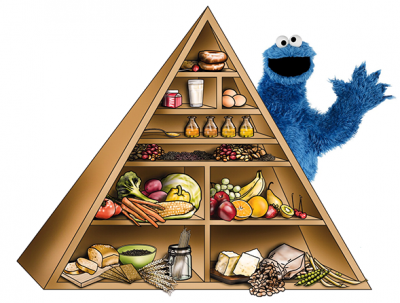 In fact, if one were to ask me for a dietary plan it would consist of 4 portions of cookies and 20 portions of coffee. 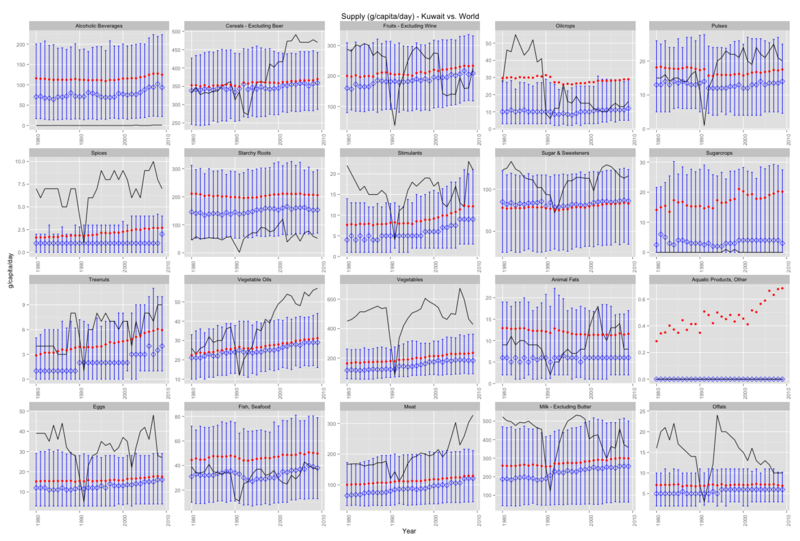 The reason I am doing this is to practice and demonstrate how to do some analysis with R on interesting issues. We already looked at the obesity in Kuwait using BMI data. What we found was that indeed, irrespective of gender, Kuwait ranks as one of the top countries with a high proportion of the population deemed obese (BMI >= 30). The question we did not address is what might be the cause of this obesity. Following in the paths of the WHO’s report on “Diet, food supply, and obesity in the Pacific” (download here) we hope to emulate a very small subset of correlations between the dietary patterns and the prevalence of obesity in Kuwait. Lets start by plotting a graph to see if we notice any patterns (click it for a much larger image). The black line represents Kuwait figures. The blue bars are top 80% to lower 20% of the observations with the medians marked by a blue diamond. that there are other interesting things going on in the plot. Cereals have been increasing since 1993. This means that the average Kuwaiti consumes more cereals every day than 80% of the persons around the world. The implication is, as explained in Cordain, 1999 that people who consume high amounts of cereals are “affected by disease and dysfunction directly attributable to the consumption of these foods”. Fruits & Starchy Roots both show trends that are below average. Both are important sources of fiber. Fibers help slim you down, but are also important for the prevention of other types of diseases; such as a prevalent one in Kuwaiti males: Colorectal cancer. The consumption of vegetables perhaps serves as a balancing factor for this dietary nutrient of which the average Kuwaiti consumes more of compared to 80% of the people around the world. Vegetable Oils is my favourite … the only thing that stopped the rise of vegetable oil supply in Kuwait was the tragic war of 1990. In 2009 the food supply per capita in Kuwait was well over the 80th percentile in the rest of the world. Vegetable oils not only cause but rather promote obesity. We don’t love Mazola so much anymore now do we? Sugars & Sweetners have already made an appearance in another post and here we have more data. The findings are similar, the average Kuwaiti consumes much more sugar than the average person around the world. This not only contributes to obesity but also other diseases such as diabetes. So lets get going … where’s the data at?! Choose the years you are interested in; I chose 1980 to 2009. 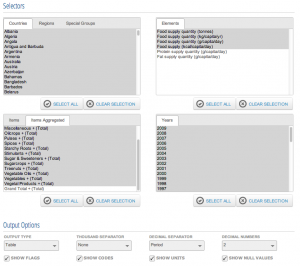 Drop-down: output table, no thousands separator, no separator and 2 places for decimals. 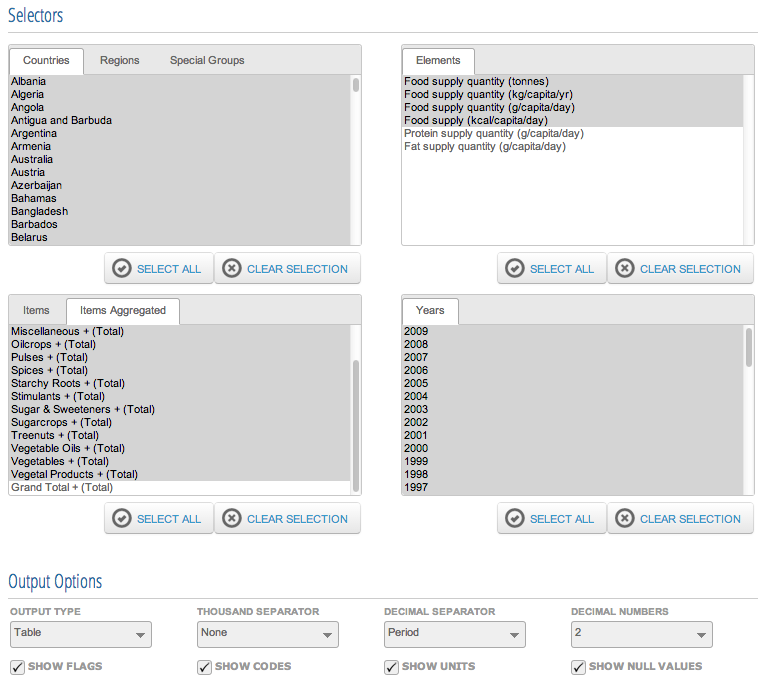 Click download and you’re set for Crops! Now repeat for the Food Supply of Livestock. So the first thing we need to do is rename the 2 downloaded folders to “first.html” and “second.html” – it does not matter which one is first or second. You will notice that the files are huge. So expect the next step to take time. We know that the files do not contain any headers and we do not want any white spaces. We will make sure that the data is read into a data frame so we can work with data frame functions. We now have our data frames and if we look into the data we can figure out what our headers should be. Lets pretend we are starting from scratch and want to read in the data from the CSV files we created. You will notice read.csv adds a column so we will also need to rename our headers. Great now we need to stop and think about what we want to do with this data. We want to compare Kuwait’s nutritional information with some sort of summary data about the rest of the world. We can therefore break this up into 2 parts: Kuwait and Other. We need to do a bit more work with the other countries’ data. We said we want summary information and right now we only have raw data for each country. We will use the chaining mechanism in ‘dplyr’ to create summary data such as the mean, median, and upper/lower quantiles. We will group the data by Year and we will then group it by Item (Nutrient). This is the same method we used earlier when looking at Sugar grams consumed per capita per day in an earlier post. Great, our data is ready for some exploration. 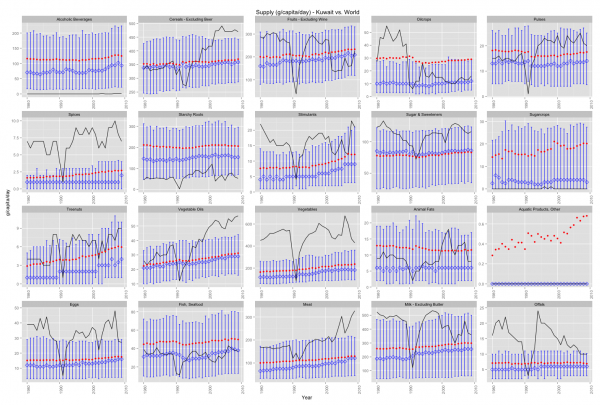 The ggplot code looks like a big ugly hairball … but I will explain it line by line. Line 1: We start by creating a plot using the data set for the rest of the world and plot median values by year. Line 2: We then overlay the blue bars by passing in our summary stats lowerbound and upperbound calculated in the previous step. Line 3: We then pass the median values and set the shape to 5 – diamond. Line 4: We plot the black line using the Kuwait data set’s values by year. Line 5: We plot the averages in red from the rest of the world data set.